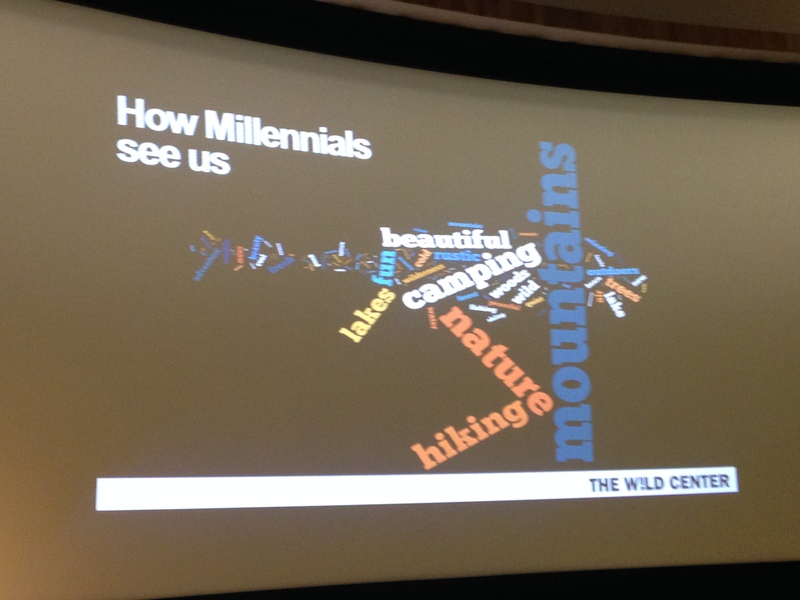 The Wild Center leadership knew it wasn’t reaching millennial travelers as well as it could, so they decided to look into how to fix that. 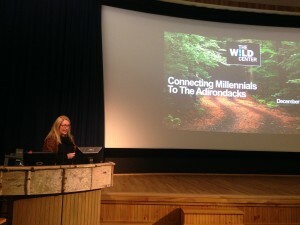 The Wild Center unveiled research that will help the museum and the entire Adirondack region target their marketing efforts in a way that will draw more millennial travelers. Millennials are currently aged 22 to 34, born between 1981 and 2000, and there are 80 million of them in the U.S. and 2.4 billion around the world, so they make up a significant portion of the Adirondacks’ potential visitor base. 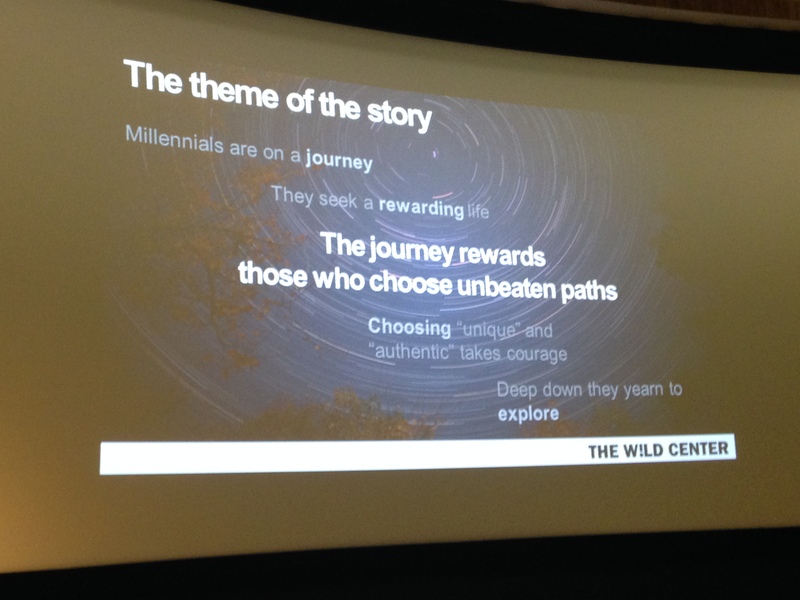 Schireson Associates, a New York City-based consulting group who performed research with funding provided in part to The Wild Center through Empire State Development’s Market New York program, surveyed millennials from the Albany and New York City areas. They found more than half of the people surveyed from the Capitol District had visited the Adirondacks, but only about 5 percent of New York City-area millennials had visited. – Millennials are generally not willing to travel more than four hours, and many of them are used to traveling on a bus. – The millennials surveyed were aware of the variety of outdoor recreation opportunities in the Adirondacks, but they weren’t aware of the variety of cultural opportunities here — museums, arts, breweries, dining experiences, and that sort of thing. That’s a challenge, because one of the big things they’re looking for when they travel is a well-rounded experience that includes opportunities to experience local culture. – They’re also interested in learning a new skill or hobby when they travel, and they’re interested in having experiences they can tell their friends about — in real life and on social media. They’re also looking for unique and authentic experiences rather than overly commercialized, touristy ones, which is something the Adirondacks are rife with. – Many of them plan their visit while they are here on mobile devices. They don’t set up a schedule of what they will do and where they will eat before the trip; instead, they look up the options for attractions and restaurants while they are here. So while the stereotype is that millennials are just taking selfies whenever they’re on their phones, they actually are using them for planning and informational purposes, making cell service and wifi important for the area’s future growth. – People often think of millennials as young people traveling with friends, but in fact the generation is now largely made up of young families. So making businesses family-friendly is important to these travelers. Overall, the Adirondacks seem to have plenty of assets that would appeal to millennial travelers, but we need to make sure we’re telling our story in a way that attracts them and helps them convince others to visit. There will be a few more opportunities to hear a presentation on the research. 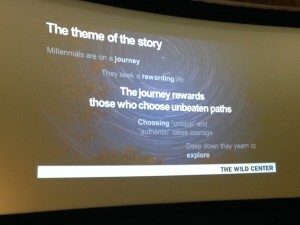 The Wild Center is also working with Trampoline, a design and marketing firm based in Glens Falls, to develop a tool kit for regional businesses to use to make it easier for businesses to use this information to help market themselves better. ROOST will help publicize both those efforts, so stay tuned!